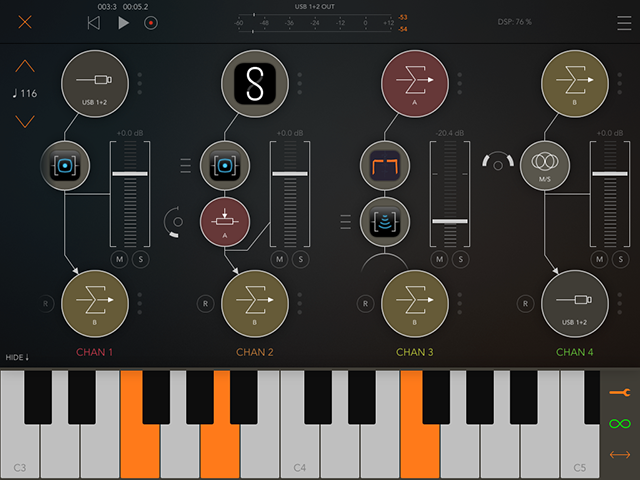 In this iOS music app review, San Francisco’s Scott Whitehead introduces us to a full-featured mixing desk for iPad music creation called AUM developed by Kymatica. 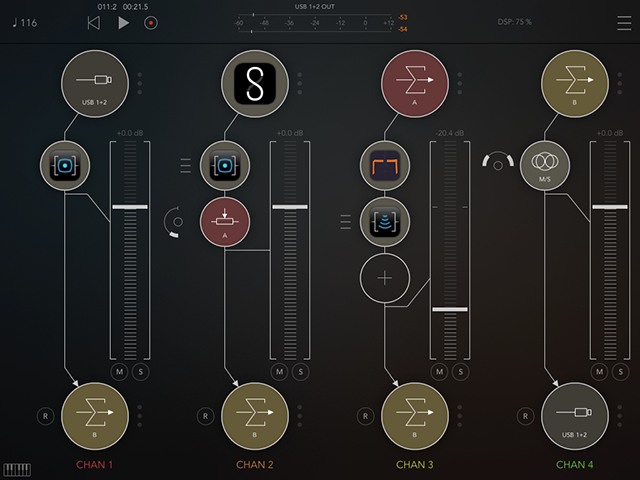 The much anticipated AUM by Kymatica promises to bring a full-featured mixing desk to your iPad music creation workflow. We got a chance to look at a pre-release version of AUM and found a clean, intuitive interface, flexible integration, and advanced features. AUM’s many features appear intuitively under each finger press, starting with adding your first mixer channel. Channel input sources can be other audio apps (including Audio Units), hardware inputs, or audio busses internal to AUM. These busses unleash the full power of AUM. As on a sophisticated hardware mixer, audio from multiple channels can be sent to another channel for additional processing. Since AUM is all software, you have extensive, flexible control over routing (pre or post fader) and send levels. iPad musicians are used to getting great features that would be out of reach in the physical world, and this is a great example. If you’re not familiar with sends and busses yet, don’t worry. Seeing it all on the screen invites experimentation, and AUM’s UI helps to tell the story. In addition to sends, you can set levels and add effects to each channel. AUM has extensive MIDI CC support so you can connect an external controller and run AUM in the background. 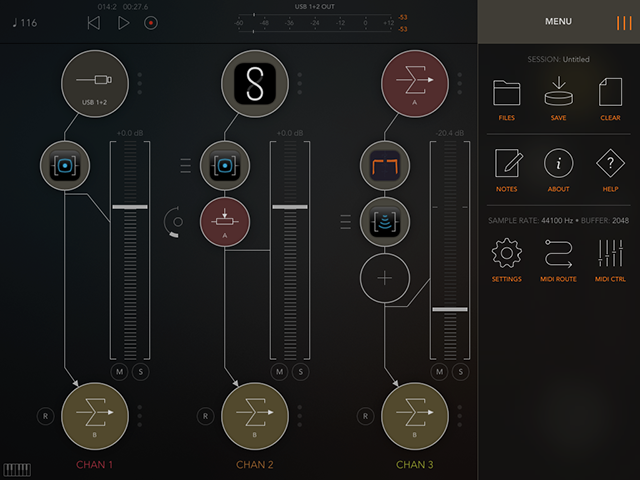 Kymatica already produces top-quality iOS audio apps, so they know the space very well. They include cutting edge features with AUM like support for higher audio rates, multiple hardware inputs and outputs, and elegant IAA and AU handling. There’s also tempo and transport control as well as a handy built in piano keyboard. AUM is feature rich, powerful, intuitive, and simple to use. It’s easy to imagine AUM becoming the de facto hub of an iPad musician’s studio. Stay tuned for a more complete tour of AUM when it is released. Scott Whitehead listens to and produces electronic music in San Francisco. He also makes interactive art at the crossroads of music and technology and spoils the heck out of his pit bull. Hear some of Scott’s work on SoundCloud. Learn the well-kept industry secrets of EQ, compression, panning, level balancing, reverb and special effects and transform rough ideas and basic compositions into a commercial master. Investigate how to use key concepts and tools in your tracks, while paying special attention to techniques of metering and spectral analysis in order to apply science alongside the art. This program gives you everything you need to refine tracks into a clear commercial quality release, including special mixing and mastering techniques for dubstep, techno, house, trance, downtempo, hip-hop, and the gamut of electronically-produced music. You will learn to mix and master your tracks using the same plugins that top industry engineers use every day, including plugins by Sonnox, Metric Halo, Altiverb, Soundtoys, Izotope, Waves, URS, and Abbey Road. Register today!